Guy Skornik - Tusk. Vinyl LP. Bleep. Expert diggers Finders Keepers Records are currently reissuing a run of soundtracks from films directed by the visionary Alejandro Jodorowsky. 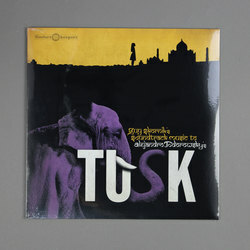 The latest in the series is Guy Skornik’s compositions for Tusk, a 1980 movie that is considered to be one of Jodorowsky’s most challenging works. Sure enough, Skornik offers up a soundtrack that befits such visionary filmmaking. Along with an ensemble that included Gong’s Steve Hillage and members of French group Cossi Anatz, Skornik’s wild music draws on everything from Magma to free jazz.